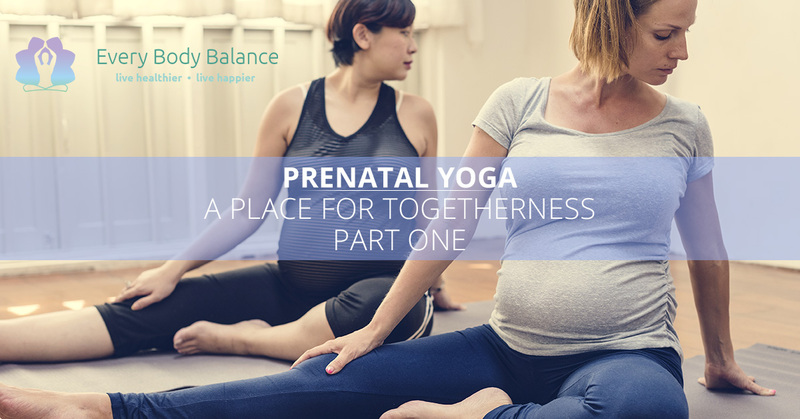 Prenatal yoga is a space for expecting mothers to find solidarity — and really a refuge to let their hair down and be with other pregnant women! When you are pregnant — anonymity is thrown out the window. As soon as you step out your front door you are no longer you — you are the “pregnant one” that everyone wants to talk to ask questions about your due date, the gender of your baby, and if you’ve picked out a name — you begin to realize that boundaries are important when people strangers want to feel your belly and touch your body without consent. This can be overwhelming and sometimes you want a place where you can just be you — prenatal is just that. You are surrounded by a group of women who share similar stories and know where you’re at — it’s a space to commiserate, share, and be active. Every woman has a different experience in pregnancy and at Every Body Balance you can move through prenatal yoga how you see fit, and over anything else, just find an hour in your day to completely relax. Below are some truths every woman knows about prenatal yoga — join in and find camaraderie and togetherness when you sweat! If you are in your pregnancy and want to stay active, prenatal yoga is a great option. You are surrounded with other expecting mothers who inherently get it. Navigating pregnancy is a time where you are most seen, yet can be very isolating. Prenatal yoga is the place where the people get you — they get the huffing and puffing of walking up and down stairs or going to the bathroom every half hour. You are surrounded by women who are riding the waves of hormones, who are exhausted, and ready to just have the baby. Some days you just need to be seen and understood — to exclaim how terrible you feel and the fear of your water breaking at work. Prenatal yoga goes beyond just a class, it is therapeutic! So much love is shown to the women, especially the ones about to give birth. This space is a great place to engage with other pregnant women, as in most classes, you begin by sharing how many weeks pregnant you are. Here you can blurt out your pregnancy if you are trying to keep it under wraps in the first trimester or talk about how awful your acid reflux is. The women can relate and you’ll see heads nodding in agreement with each remark. The most reveled pregnant women in prenatal yoga, as you’ll come to find, are the ones who are about to give birth. They are the stars, the Beyonce’s of the yoga class! They’ve made it through their pregnancy, they’ve survived, they’ve waddled their way to the end on swollen ankles and sore lower backs — and so you praise them accordingly! There are so many other discoveries you’ll come to know about prenatal yoga, so stay with us for part two! If you are ready to relax, unwind, and take some time for yourself, join us in a prenatal yoga class today!